It's finally happened: I've completed all the class stories! The bounty hunter was the last one I was missing... until today that is. I have to say that it didn't turn out to be one of my favourites, though I'm not sure how much of that was due to the story itself and how much of it was due to the on-again-off-again nature in which I played through it. 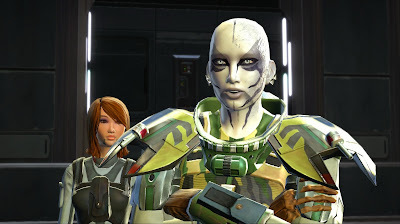 I mean, I originally made my first bounty hunter back in early 2012, played her very little (I believe I only got her to Nar Shaddaa), and then made another one earlier this year. Her journey from creation to the level cap to completing her class story took me something like five months in total, and there were a lot of breaks and distractions. Maybe that's why I didn't feel a strong sense of urgency to push onwards and find out what happens next a lot of the time. Some of that may have been due to spoilers. I got spoiled big time for the ending of the bounty hunter class story very early on, without even realising at the time that it was the very ending of the story that had been revealed to me. So I happily played on until about halfway through chapter two, at which point I realised that the only way for the event that I had read about to still fit into the story would be at the very end. Knowing exactly what lay ahead admittedly took some of the wind out of my sails. Other than that... I'm not really sure where I can accuse the story of going wrong. I felt that at the start there were some parallels to the trooper story (which I quite liked), in terms of trying to add a personal angle to a profession that is kind of cold and businesslike (soldier/mercenary). However, where the trooper story takes its time to build things up until the end of the prologue, the bounty hunter story tries to tug at your heartstrings as early as something like three quests in, where you've barely had enough time to develop an attachment to anything or anyone, so that fell a bit flat for me. I did however enjoy the way this puts you into the position of it being "you and your first companion as the underdogs vs. the world". The entirety of chapter one with its story of fighting your way to the top was quite satisfying. After that things started to flounder a bit though. It kind of felt like my character was wasting her time playing silly games, and I didn't particularly care for any of it. Things got better again in chapter three, though again I felt like I was supposed to care about characters to whom I honestly didn't have that much of a connection (yet). I did quite like the interlude where I got to go out and rescue my male love interest from peril - that felt funny in a subversive way. But well, other than that... like I said above, I knew exactly where it was going and wasn't massively excited about it. In terms of gameplay, playing a Powertech hasn't been too bad considering that neither melee nor tanking truly feel like my calling. I had however been told in advance that Vanguard/Powertech was probably the easiest tank class to play, and it certainly seemed that way. At least I never felt completely lost when I picked the character back up after not playing her for a while (unlike on my Marauder for example) and always got back into the swing of things quickly. The tanking "rotation" (as far as there is one) felt very fluid and natural. Nonetheless I think that tanking will remain something that I enjoy only in very limited doses. Charging in ahead of everyone else just doesn't come easily to me, and I don't particularly like that feeling of constantly having to reassert myself as the leader all the time. Seriously, congrats on finishing up the class stories. 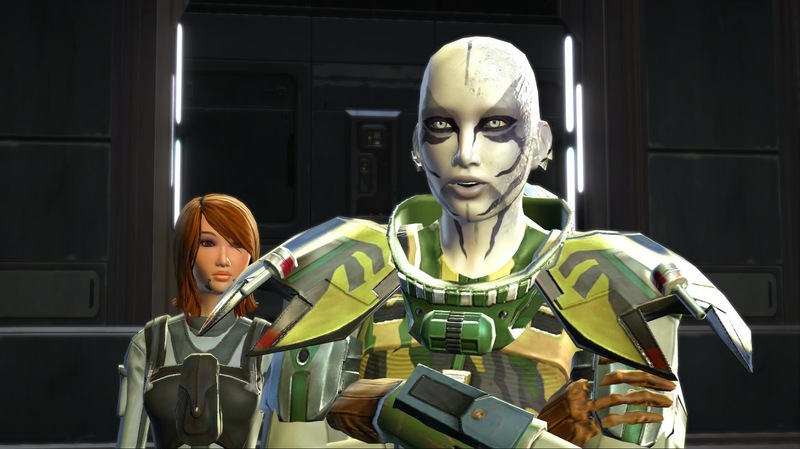 I've only finished two, myself, and have been working on Makeb on my Commando. I'd like to jump back to my Inquisitor and work on her for a while, but I find that I'm enjoying the Commando lifestyle too much. Yeah, there were things I liked and disliked about the BH story, and you pretty much nailed them. I felt like chapter 1 was super-predictable (of COURSE I'm going to win, so...?). Also, with the Mako story arc, you know EXACTLY what is going on, but when Mako asks you about it, your dialogue options do NOT include telling her the answer. It made me want to beat my head against the bulkhead, because it seemed so unnatural that game-me didn't know what was so glaringly obvious to real-me. Haven't finished the BH story yet, and only just recently made one myself (level 19 at the moment). Yay. Good work dang it.